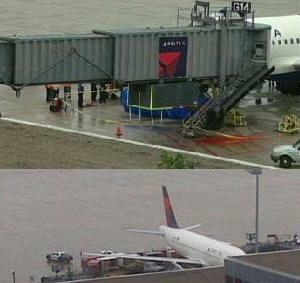 June 16, 2010 - At 5:30 AM on Tuesday, Minneapolis Saint Paul airport police received a phone call indicating that a mechanic for Delta Airlines was injured and required medical assistance at Gate G14. When emergency medical responders arrived, the Delta mechanic, 47 year old Jesse Paul Stygar of Rosemount was inside of one of the landing gear doors and had no pulse. Employees report at the time Mr. Stygar was working on the landing gear doors in the wheel well area of an Airbus A319, Flight 2789 that was to depart to St. Louis at 7 AM. The Hennepin County medical examiner's office has indicated Mr. Stygar died of a head injury. At this time there are no indications of foul play, the death of Mr. Stygar appears to be accidental and the airline is cooperating with investigators. The Airbus A319 has been taken out off service pending investigation of this accident. Passengers were transferred to different aircraft and the flight to St. Louis departed on time. Friends and coworkers stated Mr. Stygar had worked for Delta for five years as a line mechanic, had served in the military, lost his wife in 2008 she was 44 years old, and was raising his 12 year old son Joey as a single parent. Stygar's family released a statement on Tuesday, ?Jesse loved life and most of all, his son, Joey. Jesse was a hard worker but also loved traveling, the outdoors and most of all fishing, which he did often with Joey. Jesse?s other love was collecting, from cars to motorcycles to just about anything. ?Jesse will be greatly missed by family, friends, neighbors and his soul mate Vicki. Anyone that crossed his path knew he had a huge heart and gave everything he could. Jesse served in the military and kept that love of our country alive. He will be greatly missed. This is the only statement that we will be making at this time. We ask that you please respect our family's privacy at this very difficult time." ?We extend our deepest sympathies to his family and friends and offer our full support to them and our people in Minneapolis? said Delta Airlines. Occupational Safety and Health Administration (OSHA), NTSB, FAA and airport police along with the medical examiner's office will be investigating. Extra 500 Spirit Turbo Prop Aircraft Coming To The U.S.